When you look at the monthly data, you gotta ask if the subprime problem has permanently lowered sales or just delayed closings. Will we see the ramp up in April? Also, we're still comparing 2007 to the best year ever in 2005 and an OK spring in 2006 - what was normal? You guys are like drug addicts... it takes more every time to get high! Subprime is still going strong my friend. I have several friends that are still doing just as many subprime loans as they were a year ago. Subprime isn't just for people will sub 600 FICO scores. My comparison points out things are changing, not disintegrating as you seem to be interpreting. It also contradicts what the industry is saying in terms of the market turning around right now. We're comparing 2007 to 05 and 06 because it tells us where we're going. Strange that nobody was complaining when we compared 2005 to 2003 and the market was heading off the charts. You guys are like drug dealers...Always trying to make people high. You were honored yesterday by Lander, but I did not see your acknowledgment. I know some, including yourself may take it as a left handed compliment, but it isn't. You have a rightful place of respect on the Sacramento blogs and bring the balanced perspective we all need to see. The world is not going to he77 in a handbasket. We all made it thru the early 1990's and we will all make it thru this cycle. Your points are always knowledgeable, often hilarious and usually taken well. That is why you were so honored. You guys are much too sanguine about the future of the RE market around here. Agent, soft-peddling the sub-prime implosion doesn't change the fact that 45 lenders have now imploded since December, and we are now getting ready for wave 2 (here come the Alt-A's.) Only time will tell if the sub-prime implosion is the pin that pricks the larger credit bubble, and if that happens look out!! My personal opinion is that sub-prime is the pin and we are headed straight for GD2, although it may take a couple of years to get there. Toxic waste cannot be made un-toxic all of a sudden. No bubble can be manufactured to offset RE losses – none are big enough. All we know for sure right now is that credit contagions always start at the margin and rapidly develop into firestorms that envelope the core. If we start seeing Alt-A's begin imploding at the same rate as the sub-primes, then you'll know that the contagion has turned into a conflagration. Also, the reset chart that Max showed should tell everybody what they need to know: the bloodbath is just beginning and look out below!!! I used to think that Sacramento would be in for a 50-60% haircut peak to trough. Now I’m starting to see that it will be more like 80%, but that will be the least of our worries. By the time RE bottoms, we will be in the middle of GD2 and quite possibly WW3. JMHO. I don't think I was soft-peddling the subprime market. Take a look at my prior posts and you'll know I'm just as cynical about this market as the next guy. 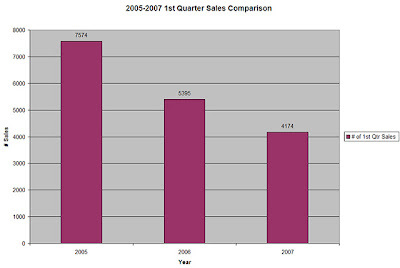 However, I was just trying to tell sippin that there are still plenty of subprime lenders out there willing to loan a buck to the next buyer that walks through the door, so my personal view is that the subprime implosion might not necessarily be behind the drop is sales stats for March and the 1st quarter overall. IMHO, buyers are starting to see the light and realize that patience really will pay off. "there are still plenty of subprime lenders out there willing to loan a buck to the next buyer that walks through the door"
Agent, you bring up a good point. If the subprime lenders that you know are still doing a brisk business, perhaps it is BECAUSE of the other 45 that have already imploded. In other words, if there are far fewer lenders then the lenders that are still around are picking up a much larger portion of the pie, even if the total pie is a lot smaller. Just a thought. 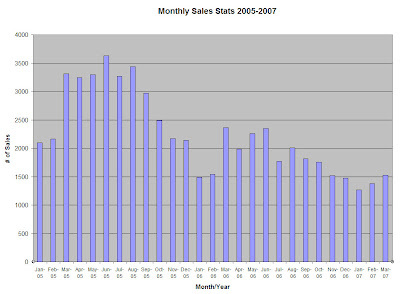 A 50% drop in sells from peak to now, or almost. Thats alotof gravy not being poured out now. Too bad for the mortgage brokers and realtors. Oh this market will get much worse. "Will we see the ramp up in April?" Are you making a prediction? I'll be willing to give you through June if you are. You're good at playing the devil's advocate, but usually do it without conviction. Sittn - thanks for the heads up on Lander's - I missed it but figured it out - funny! On the subprime/lender changes - my impression, because it delayed a payment to me from someone trying to close a HELOC while the lender increased the documentation requirements, is as the industry bumps along, it will cause further delays in closings. Those who remain will be very busy. I like Countrywide's CEO today saying "leave us alone" to the Feds but in my head a little scottish guy is saying "Captain - I don't know if I can hold it together any longer". Dude, to I have a story for you. Stay tuned. Let's stretch it back a bit to 2001. Here's a look at a slightly different data set (SAR). That should shut me up. But we heard about enough pending gains that I expect some better "bump". AB, this is amazing work. Nice feeling being ahead of the curve (read mainstream media :) on these issues. Thanks for all the hard work you do here.